In the article 12 More Law Schools Face Lawsuits Over Job Placement Claims, the article’s author, Katherine Mangan, reports on the increasing number of law schools that have been sued for overstating the job prospects of their graduates. The articles lists the law schools that are the defendants in this latest round of lawsuits. The law school defendants include for profit and other law schools, including, for example, DePaul University College of Law and Hofstra Law School. Where does critical thinking fit into the law school graduates’ plans? The lawsuits are disturbing because critical thinking seems to be in short supply. No job placement statistics are guarantees. Job placement statistics provide information on the employment of past graduates-not guarantees that current graduates will find jobs. 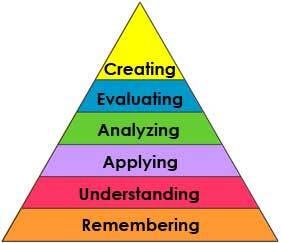 Critical thinking requires, among other things, that people analyze and evaluate information (see the revised Bloom’s taxonomy as pictured in this post) based on reflection, observation, evidence and reasoning. These are, I would hope, hallmarks of legal analysis and are reasonable expectations for those who have up to 7 years of post-secondary education. It’s disheartening to think that law school graduates have not developed those skills as well as I’d like to think. Or maybe this is evidence that law schools will do anything, even attempt to mislead, in order to make money through recruiting graduates (and future donors). Ida's Blog by Ida M. Jones is licensed under a Creative Commons Attribution-ShareAlike 3.0 Unported License.